The right of informed consent is only tested as a right when the patient resists. And of course all those yeses don't mean anything unless that 1 in 100 patient also has the right to say no. There is no yes unless you also have the right to say no. Also don't miss the comment at the end by Maternal Fetal Medicine specialist Emiliano Chavira (a lovely, gentle, caring person I had the honor of meeting at the Amsterdam Breech Conference this summer). Take the time to watch the whole presentation. Share with your physician/midwife/nurse colleagues. Share with pregnant women and their families. All the things I care deeply about--midwifery, home birth, physiological birth, vaginal breech birth, VBAC, cesarean rates--boil down to a fundamental human rights issue: does a woman have the ability to choose what happens to her, to her body, to her baby, when she is pregnant and when she is giving birth? Is she being manipulated, coerced, or forced into something she does not want? Are her providers supportive and understanding and respectful of her autonomy, even in the face of their own fears and assessments? Is the pregnant woman being given accurate and appropriate information, or only being told information that will skew her towards a certain action? Informed consent is THE fundamental issue in maternity care. I also think that it holds the potential to be the driving force that will solve these issues. Hermine ends her presentation with the phrase Fiat iustitia ruat cælum--"Let justice be done though the heavens fall." May we shake the heavens and uproot anything that prevents women from being--to borrow a phrase from Hermine's presentations--the captains of their own ships. 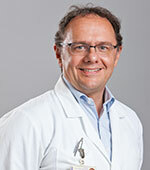 Lester Bergenhenegouwen, MD PhD, is a gynecologist at ZGT Hospitals, Albelo and Hengelo, in the Netherlands. She did her PhD research on breech, twins, and triplets. 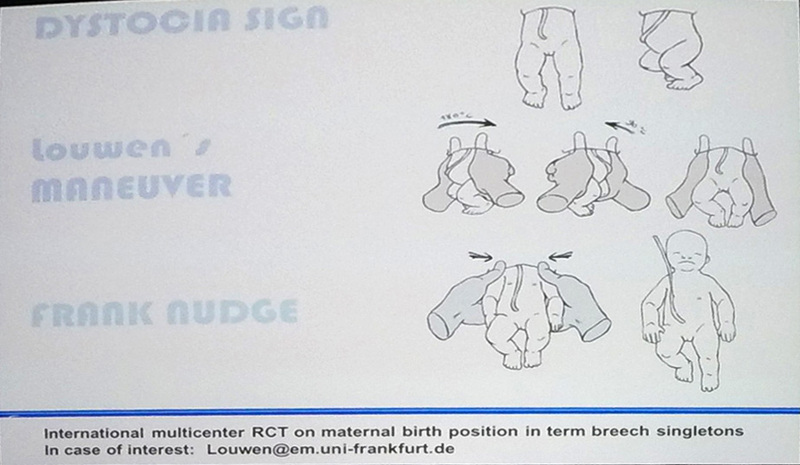 She began her presentation with some statistics about the frequency of breech presentation at various gestation points. 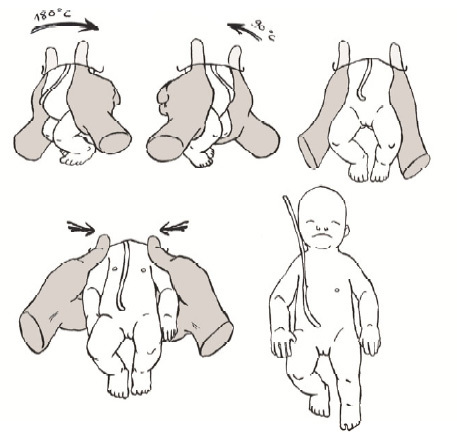 The optimal mode of delivery for a preterm breech baby is a subject of debate. No large RCTs exist on this particular topic—all were stopped due to recruitment difficulties. 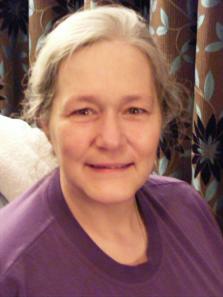 She helped author a systematic review of relevant cohort studies (Jan 2014). 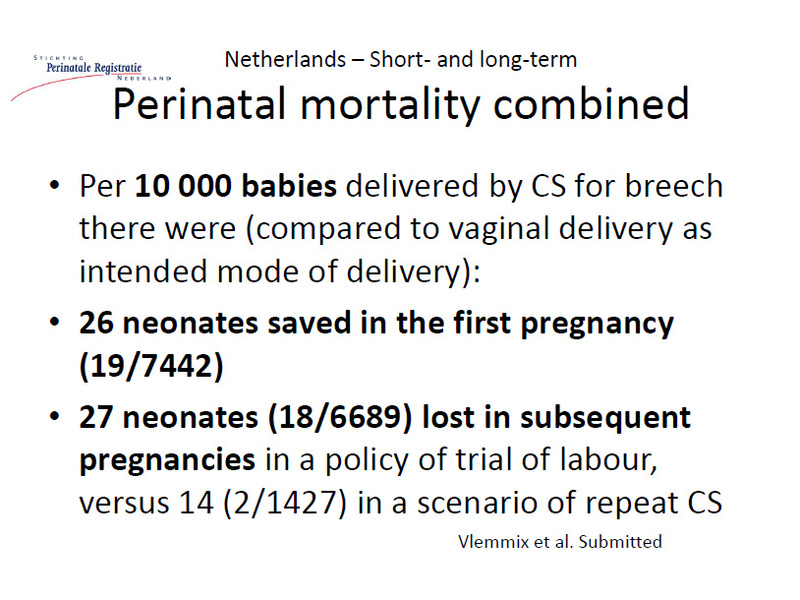 Her review found that cesarean section for preterm breech babies reduces neonatal mortality. However, the studies lacked intention to treat analysis and had other biases inevitable in cohort studies. 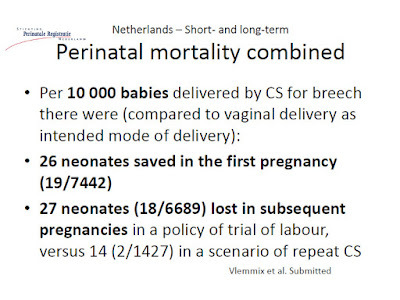 Lester also did a study of preterm breech singletons using the Dutch birth registery (Dec 2015). 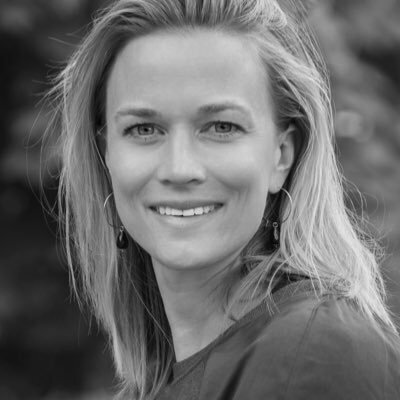 She found that planned cesarean section "was not associated with a significant reduction in perinatal mortality compared with intended vaginal delivery. 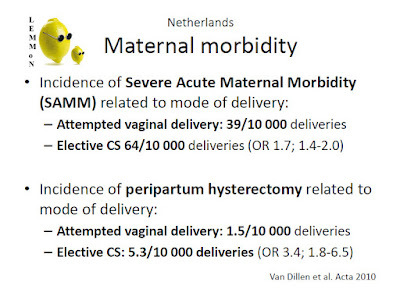 However, the composite of perinatal mortality and morbidity was significantly reduced in the intended cesarean delivery group." 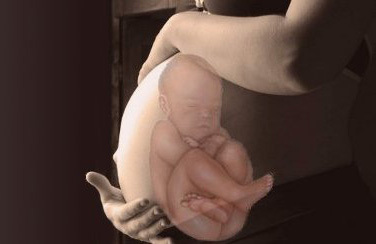 For babies at 28-32 weeks gestation, planned cesarean section shows the most benefit. 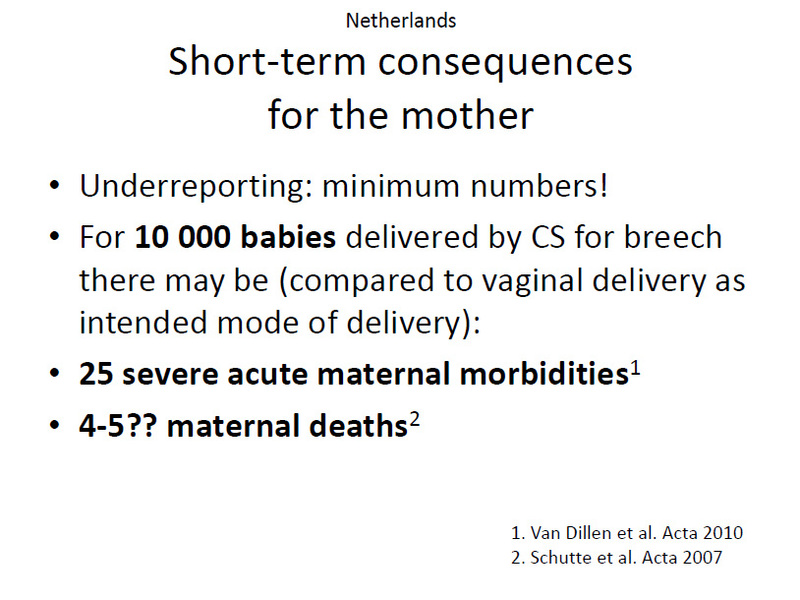 Lester reiterated that the lack of large RCTs is still a major issue in studying preterm breech birth. Planned cesarean section brings some benefits to babies between 28-32 weeks, but the overall effect is small. 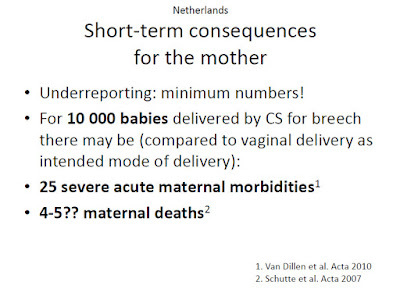 The major risk from the preterm births is from prematurity, not from the breech presentation. 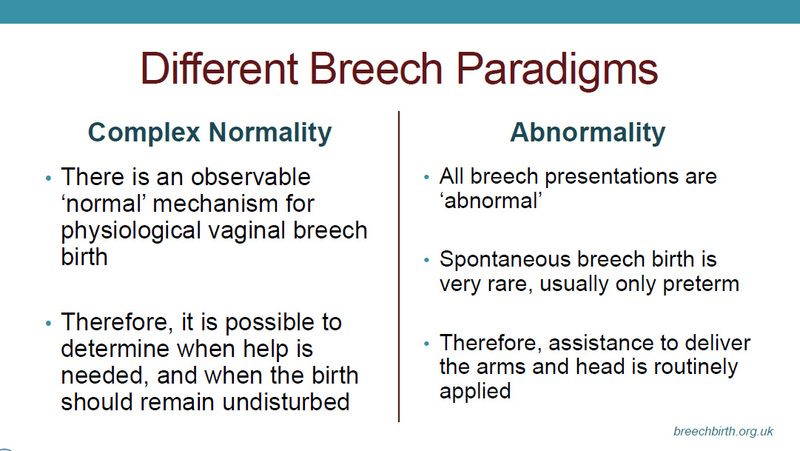 The additional risk of vaginal breech birth is minimal. Below is the letter I am sending to Glendale Adventist Medical Center regarding their recent ban on vaginal breech birth. Let the wrath of Rixa descend upon them! Please, don't forget to write your own letters and make phone calls. If you are in the Los Angeles area, attend the rally on Sep. 7th. 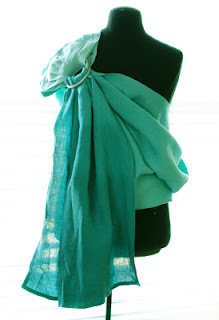 I am offering a ring sling and infant scale sling as a giveaway for anyone who participates. I am writing to express my extreme consternation about the recent ban on vaginal breech births enacted by Glendale Adventist Medical Center. I am also contacting the Adventist Health Compliance Program and Karen Brandt, director of Women and Children's Services, about my concerns. I am a maternity care researcher and academic, and one of my main research interests is vaginal breech birth. 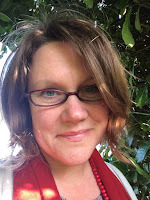 I am also a mother of four children, so a banning vaginal breech birth is a personal issue as well as a professional concern. 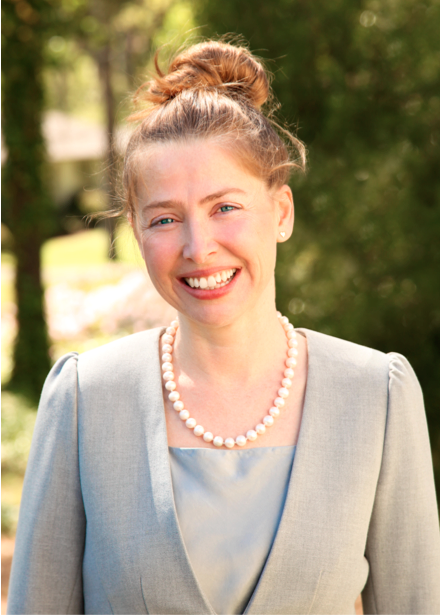 I am currently collaborating with a British midwife and breech expert, Shawn Walker, to help hospitals safely implement vaginal breech services. 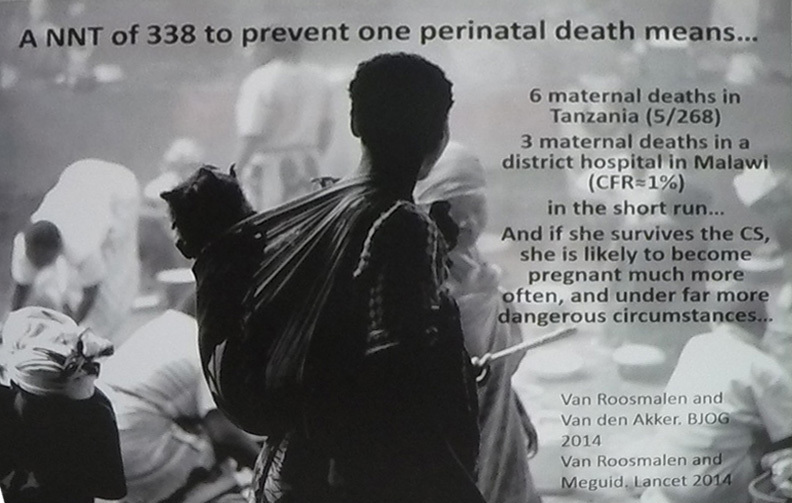 As the evidence mounts that vaginal breech birth can be a safe option, especially when supported by experienced providers (1-9), it is unethical to ban women and their providers from the option of a vaginal breech birth. 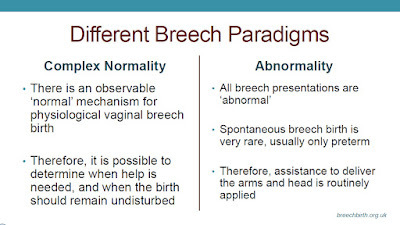 Recent ACOG practice bulletins uphold vaginal breech birth with experienced providers (10). [A] decisionally capable pregnant woman’s decision to refuse recommended medical or surgical interventions should be respected. The use of coercion is not only ethically impermissible but also medically inadvisable because of the realities of prognostic uncertainty and the limitations of medical knowledge. As such, it is never acceptable for obstetrician–gynecologists to attempt to influence patients toward a clinical decision using coercion. A vaginal breech ban forces providers to coerce their patients into unnecessary, unwanted surgery. Each hospital shall provide each patient, upon admission or as soon thereafter as reasonably practical, written information regarding the patient’s right to the following:… Participate actively in decisions regarding medical care. To the extent permitted by law, participation shall include the right to refuse treatment. Glendale Adventist’s new policy banning vaginal breech birth is not just unethical and illegal—it is harmful to women and babies. Women who have cesarean surgeries face a higher risk of death (13-14). Their subsequent pregnancies have worse outcomes than those of women who had vaginal births (15). Banning vaginal breech births forces women to undertake these risks with no added benefit. I urge you to make every possible effort to reverse this policy. 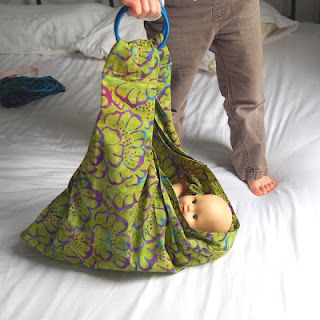 Instead of banning vaginal breech births, the better course would be to encourage all maternity care providers to become skilled in vaginal breech births, so that all women are able to have a safe, respectful birth in the manner of their choosing. 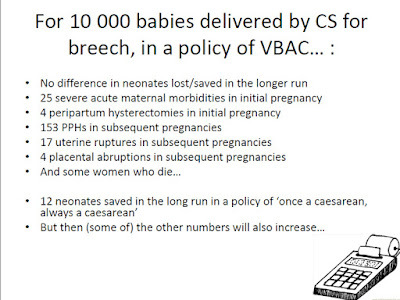 Universal, mandatory cesarean section is not the answer to breech presentation. The solution? Upholding women’s autonomy and allowing providers to attend vaginal breech births. 1. 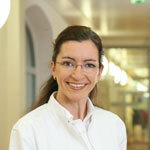 Uotila J, Tuimala R, Kirkinen P. Good perinatal outcome in selective vaginal breech delivery at term. 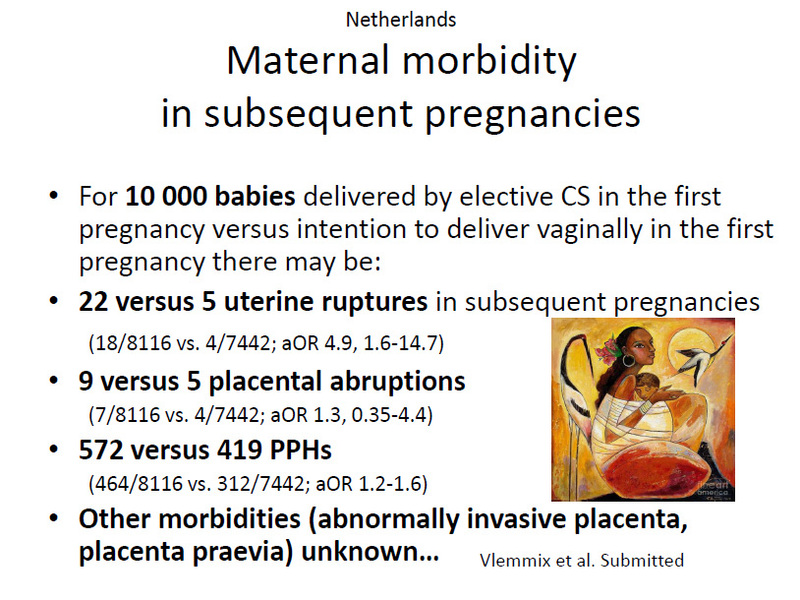 Acta Obstet Gynecol Scand 2005;84:578–83. 2. 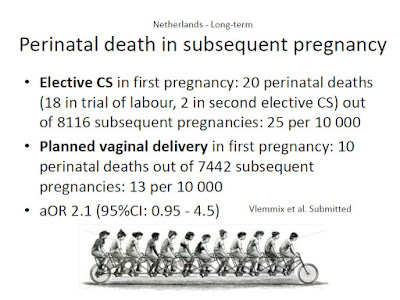 Albrechtsen S. Breech delivery in Norway—clinical and epidemiological aspects [dissertation]. Bergen: University of Bergen; 2000:1–68. 3. Rietberg CC, Elferink-Stinkens PM, Brand R, Loon A, Hemel O, Visser GH. 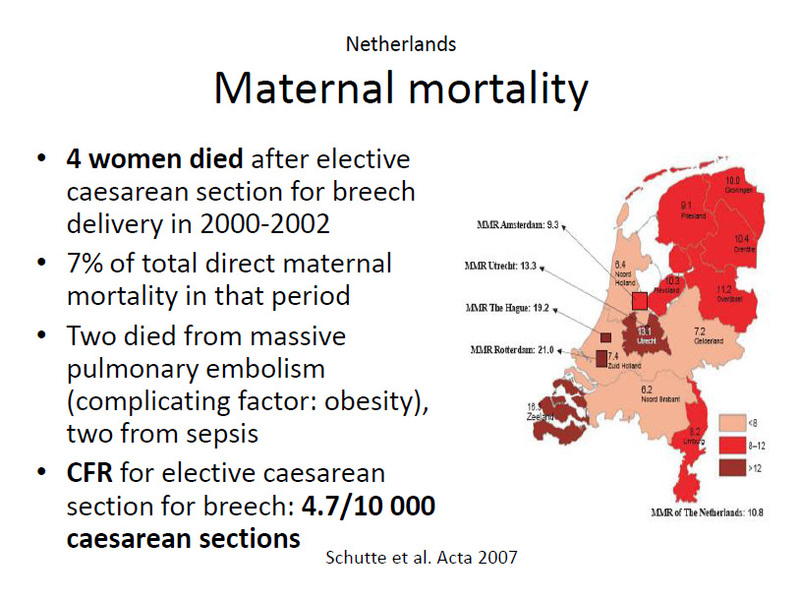 Term breech presentation in the Netherlands from 1995 to 1999: mortality and morbidity in relation to the mode of delivery of 33824 infants. BJOG 2003;110:604–9. 4. 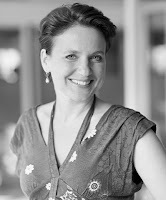 Hellsten C, Lindqvist PG, Olofsson P. Vaginal breech delivery: is it still an option? Eur J Obstet Gynecol Reprod Biol 2003;111:122–8. 6. Kumari AS, Grundsell H. Mode of delivery for breech presentation in grandmultiparous women. Int J Gynaecol Obstet 2004;85:234–9. 7. Haheim LL, Albrechtsen S, Berge LN, Bordahl PE, Egeland T, Henriksen T, et al. 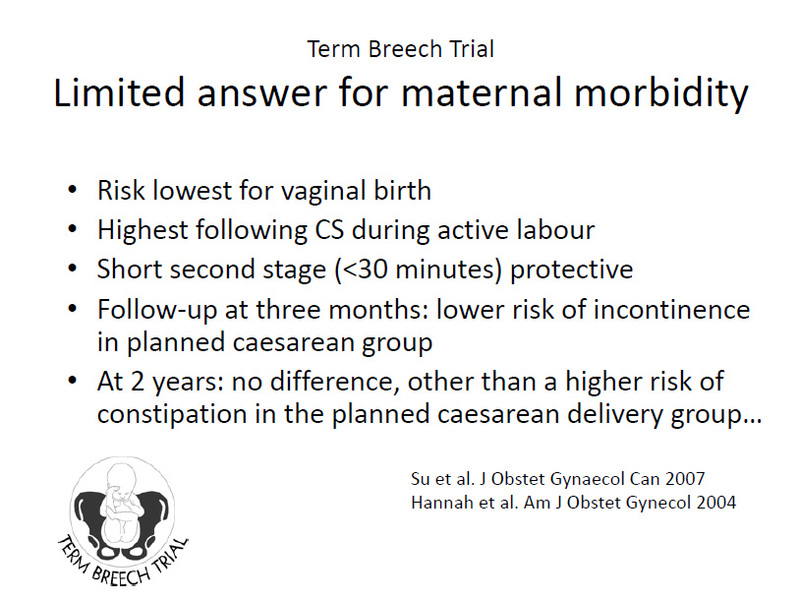 Breech birth at term: vaginal delivery or elective cesarean section? A systematic review of the literature by a Norwegian review team. Acta Obstet Gynecol Scand 2004;83:126–30. 8. Goffinet F, Carayol M, Foidart JM, Alexander S, Uzan S, Subtil D, et al. 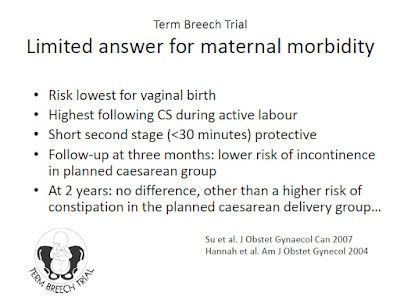 Is planned vaginal delivery for breech presentation at term still an option? Results of an observational prospective survey in France and Belgium. 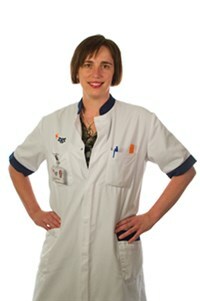 Am J Obstet Gynecol 2006;194:1002–11. 9. Rietberg CC, Elferink-Stinkens PM, Visser GH. 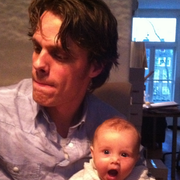 The effect of the Term Breech Trial on medical intervention behaviour and neonatal outcomes in the Netherlands: an analysis of 35453 term breech infants. BJOG 2005;112,205–9. 10. American College of Obstetricians and Gynecologists. Practice Bulletin No. 161: External Cephalic Version. Obstet Gynecol 2016;127(2):e54–61. 13. van Dillen, J., Zwart, J. J., Schutte, J., Bloemenkamp, K. W.M. and van Roosmalen, J. (2010), Severe acute maternal morbidity and mode of delivery in the Netherlands. Acta Obstetricia et Gynecologica Scandinavica, 89: 1460–1465. 14. Schutte JM, Steegers EA, Santema JG, Schuitemaker NW, Van RJ. Maternal deaths after elective caesarean section for breech presentation in the Netherlands. Acta Obstet Gynecol Scand 2007;86:240–3. 15. Caughey AB, Cahill AG, Guise J-M, Rouse DJ. 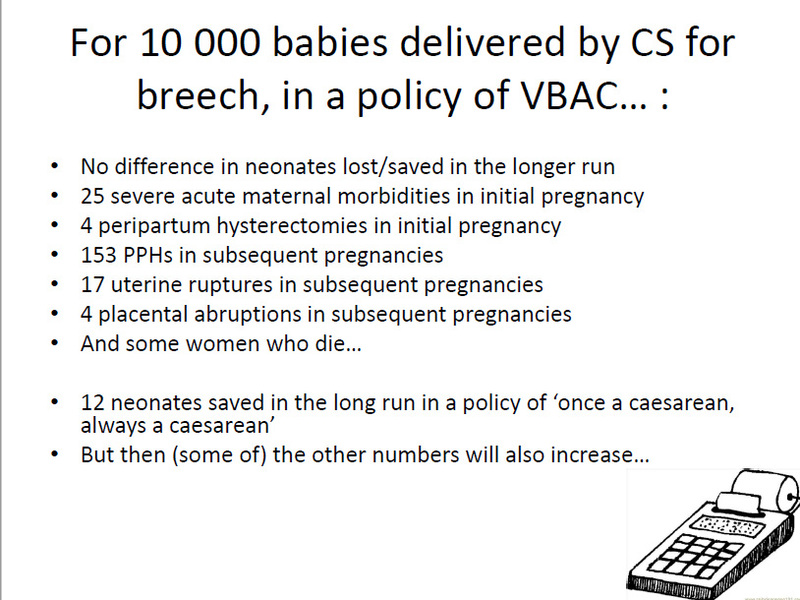 Safe prevention of the primary cesarean delivery. 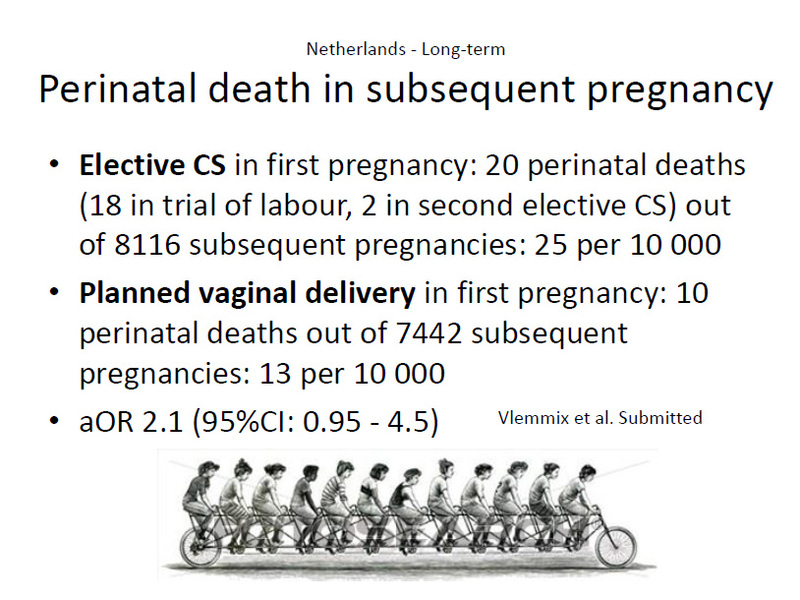 Am J Obstet Gynecol 2014;210(3):179–93.